Parc de Ritero was quite a small almost rectangular circuit surrounding a large lake & located very close to the centre of Madrid. The most distinguishing feature of the circuit for me was the long left hand sweeping bend at one end of the circuit connecting the two main straights of the circuit together. As may be seen from the accompanying photographs, the surface of this sweeping bend was like polished marble! The main straight on which the starting grid was located was quite wide. At the end of this straight was a sharp left hand turn onto a narrow short straight before turning sharp left onto the back straight of the circuit which led to the start of the long left hand curve taking the riders back onto the main straight once again. The races were held at a time when General Franco was still in power but as evidence of the political changes on the horizon, Prince Carlos, Spain’s future King and Head of State, was the Government’s senior representative and the FIM’s guest of honour at the meeting. His attendance required the assembly of a very large Royal Box on the outside of the circuit placed next to the starting grid at a point where any riders sliding off their machines when exiting the long left hand bend could finish up, that is, if they were not so unfortunate as to slide right up under the Prince sitting in the Royal Box! RM during early morning practice – the scaffolding can be seen still going up to protect The Royal Box! The weather in Madrid for practice, the races and camping out was just perfect and I think we all enjoyed our last week in Spain. Practice went well for me and for most of the Colonials but we were all treating the long left hand bend with considerable caution. One or two of the Spanish riders were not being so careful and as a result ended up, as predicted, exploring the underside of the Royal box! During the first practice session I discovered, almost by mistake, that if I peeled into the left hand bend very late, and took a line to come out of the bend within 2 feet of the inside of the track, I gained a considerable advantage. This was due to there being a storm gully at this point on the roadside which was banked at about 15 degrees towards the inside of the track. Hitting this point was like starting the climb up the ramp of the wall of death, a manoeuvre I had performed on a number of occasions as a teenager at local fair grounds in Guildford and Godalming! This tactic enabled me to keep the power on through the bend and gain 20 or 30 yards over many of the other riders at this part of the circuit. In the presence of Prince Carlos, we all assembled in the afternoon for the start of the 250 race. Along with Barry Smith on his Aermacchi, I was on the second row of the starting grid with Spanish factory Works riders all around us. I also noticed that Ramon Robinson was starting on the 3rd row of the grid right behind me on his MSDS Parilla. With this being the last race of the Spanish series and of the season for most of the Circus riders present, there was quite a lot of tension before and at the start of the race! 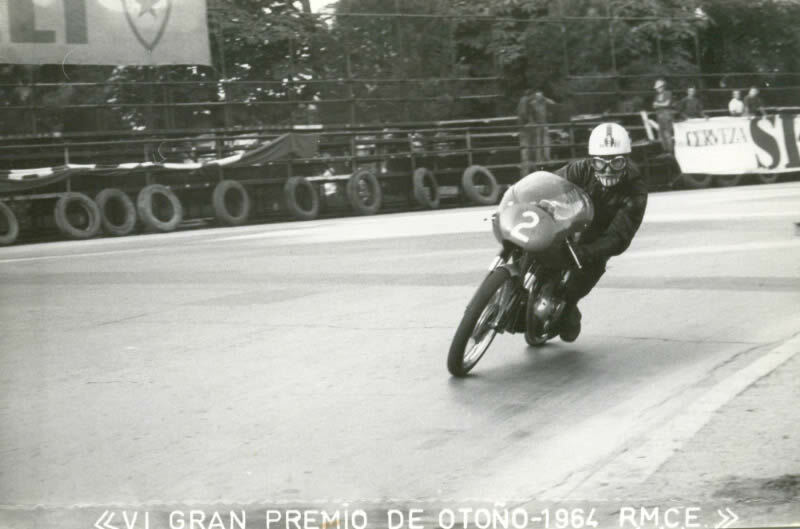 With one of my best ever starts I was right up behind Ramon Torras and two other Spanish riders as we reached the end of the main straight and turned into the first tight left hand bend. Hitting my identified storm gully at the best possible point, I shot out of the first bend so fast that I came very very close to hitting the rear wheel of the rider ahead of me! My immediate reaction was to back off for just a split second which was a big mistake as this allowed Torras and the other leading riders to get so far ahead of me I could not gain the advantage of a tow from them down the next straight. Once they got away, they were gone! Now coming under pressure from following riders, I had to rely on utilizing my storm gully tactic more and more as we changed places lap after lap. At approximately half way through the race, Barry came past me on his Aermacchi. This turned out to be to my advantage as by gaining a good tow down the straights behind Barry, he helped me to get past and pull clear of the pack of riders with whom, up to then, I had been constantly changing places. With the help of his tow, I could stay with Barry but my Parilla did not have the power to pull past him. 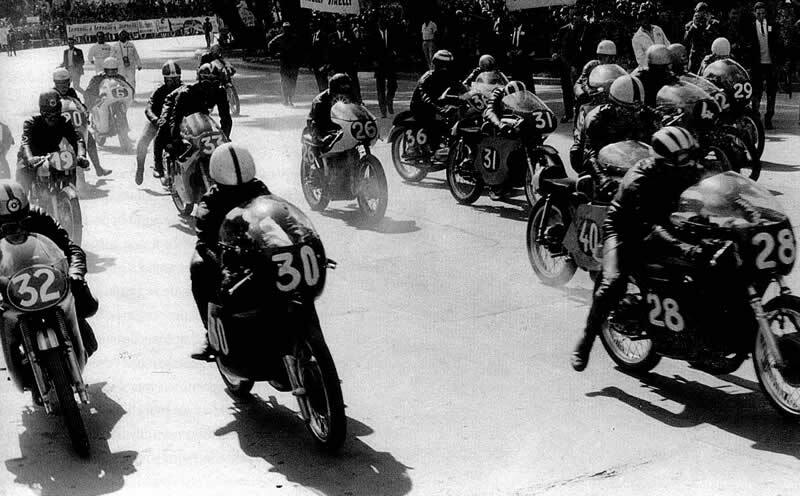 Once well clear of the following pack, I backed off a little and settled for taking 7th place at the finish.The race was won by Jose Maria Busquets (Montesa) followed home by Renzo Pasolini (Aermacchi) and Pedro Millet (Montesa). I think Barry finished in 5th or 6th place. 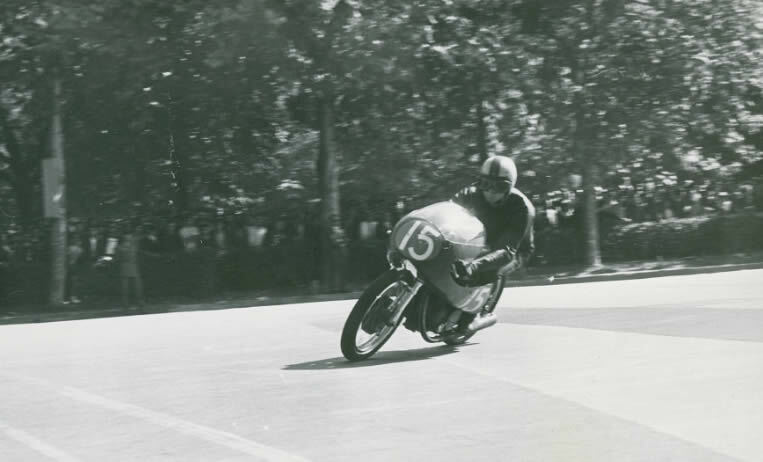 Some riders were finding it difficult to accept that the racing season had come to an end here in Madrid and facing the prospect of returning home to the cold Winters of Northern Europe. So the beer flowed and there were many more tales told throughout the evening and well into the following morning. For me, the time had come to start packing up & heading for home. Before leaving Spain, and with the help of a local hotel receptionist, I made contact by telephone with Parilla in Milan, The call was to find out if the new 250 G.P racer was ready for testing as we had discussed and planned back in June. The end of yet another dream? On my return to the UK, the 125 short stroke Parilla with the 5/6 speed gearbox and the 256 Racer together with the long stroke 125 engine, were all returned to Capriolo/Parilla in Croydon. The MD, Cyril Ashford, very generously gave me the 250 Parilla to keep. The Bedford Dormobile, now with 3500 more miles on the clock and in much better service condition than when I had collected it, was returned to the Tooting depot. I then cleaned and put my leathers and all my other racing gear away knowing this was, perhaps, for the very last time?